For many soon-to-be dads, welcoming a son or daughter into the world is as overwhelming as it is rewarding. But, new dads who are worried about their fathering skill sets can take advantage of a new program appearing in 50 hospitals across the country that aims to better prepare fathers-to-be for the road ahead. The so-called Boot Camp for Dads was created by Greg Bishop, and it provides men with a helpful guide, BabyCenter.com reports. By allaying any early fears, Bishop hopes that his courses will allow new dads to be involved in caring for their children from the beginning. According to Bishop, his course touches on a number of areas relevant to new dads. For one, being patient and positive is key, with both your new baby and your wife (who may be a bit overwhelmed herself). 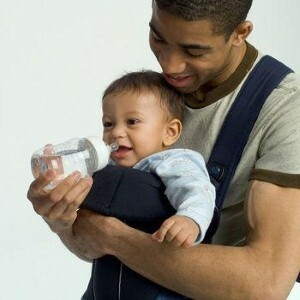 Additionally, fathers should not hesitate to handle their new babies. "No matter what happened during pregnancy – whether or not you played Mozart to the fetus – the rubber hits the road when the baby is born," he told the website. "Jump in now – the more you do with your baby, the quicker you'll bond." As a final caveat, Bishop reminds attendees that while there will assuredly be frustrating moments, they will pass, and that dads should relax and enjoy spending time with their child.